Last Thursday we farewelled our old friend Bundy. We knew that his time was approaching - he was close to 18 years of age which is a pretty good vintage. 18 years of loyalty and love - and such a dignified dog. In the end his mobility issues were too much to delay the inevitable, and the vet put him to sleep. He was buried at our place. He was a Smithfield cattle dog, a red stumpy tail. A little unusual, not seen too often, they are a slightly different from the blue heeler type. A little taller maybe than a standard cattle dog, but solid and tough. I brought him home from the markets (back in the day when you could pay $50 for the pick of a litter in a cardboard box) and surprised my husband with a present. There had been a minor burglary next door to us a few weeks earlier and we had talked about getting a guard dog. A cattle dog turned out to be a good choice and after Bundy came onto the scene, there were no problems. He proved to be a major part of our lives. Always close by, well mannered and gentle to those he knew as accepted by us. 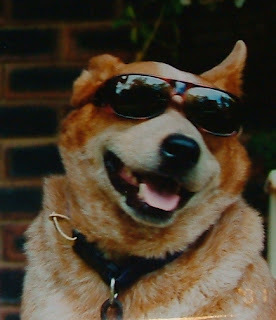 I think most people are a little wary of a cattle dog, but he was always well behaved. In his later years, he had to put up with the intrusion of two more dogs into his life. Angel, the bumbling black Labrador/kelpie cross, and Dexter the terrier cross. Both well below his level of intelligence (sorry to Angel and Dexter, but it's true!). But he accepted them into the family, while still maintaining his place as top dog. Goodbye Bundy, you will be missed. I am so sorry to read about your loss. To lose such a part of your little family must be heartbreaking. Goodbye Bundy, I know you had a wonderful life but it never seems like enough. 18 is a fine innings for a loyal dog. I hope you are getting through this o.k. Wendy and family. Losing a loved pet is never easy. oh Wendy, big hugs to you, and the family. What a wonderful life Bundy had with you all. What a lovely boy he was. It is good to hear about Bundy and his wonderful life with you. It is always sad to lose them, but they live on in your memory and become legends. How strange -I just read this post after turning off the end of 'Marley and Me' because I couldn't bear the impending death of the old dog in the movie! I'm so sorry for the loss of your faithful friend. The photos of him are so full of character. Oh I am so sorry Wendy... he looks like a really lovely animal, and it's always happy to hear that they have had such a wonderful life. I'm so glad you were able to bury him at your home, what a lovely resting place. RIP old fella. So sorry to read about the loss of your beloved pet. So glad he could come back home with you were he would want to be. Take care. Oh, Wendy -- it is hard to say goodbye to such a special friend. Sounds like you had so many good times together -- hope you are doing ok.